Envíe un mensaje al músico indicando su interés, preguntas, si tiene algún proyecto en curso, etc. Musicall se encargará de contactarlo rápidamente y nos comunicaremos con usted. There are different oral and written versions of when Los Gaiteros de San Jacinto was formed,but most agree that the group, as it is recognized today, had come into existence by the 1930s. In the mid 1950s, they undertook their first tour throughout Colombia, under the leadershipof folklorists Manuel and Delia Zapata Olivella. In 1958, they toured internationally to China and Japan, and to Russia, Germany, France, Italy, Spain, and other European countries. In 1968, they Performed at the Olympic Cultural Games in Mexico. Their touring, the exceptional quality of their musicians across generations, and the fact that they are one of the few gaita ensembles whose music has been commercially produced have made them the most important musical group of gaitas and Cumbia in Colombia and worldwide. The founder and initial leader of the Gaiteros de San Jacinto was Miguel Antonio “Toño” Fernández (1912–1988), after the death of Toño, Nicolas Hernandez (1918-2013) was at the Direction until his death. Today, the elders of the group are Manuel Antonio“Toño” García (female long gaita), and Juancho “Chuchita”Fernández (voice), who trace their direct lineage and heritage to the founding members. The other members of the group are: Rafael Castro Fernandez ( Lead Vocal) Gabriel Torregrosa (Director, gaitas, short gaita, pito atravesao, llamador drum, vocals), Damian Bossio (female long gaita, maracones, vocals), wilson Fontalvo (Alegre drum, vocals, gaitas), Alberto Posada (Tambora drum, vocals), John Fuentes (Male Gaita, drums),and as a guest Javier Mutis Garcia: percussion and emcee. The fact that the group has persisted and includes several generations of musicians speaks to the vitality ofthis tradition. Los Gaiteros de San Jacinto are a musical icon in San Jacinto and Bogotá and a reference point for other gaita musicians throughout Colombia. Through their own new compositions and through teaching young musicians, they are a crucial link between traditional gaita music and its contemporary renewal. Thanks in great part to them, gaita music has become one of the most influential traditional musics in contemporary Colombian popular music today. 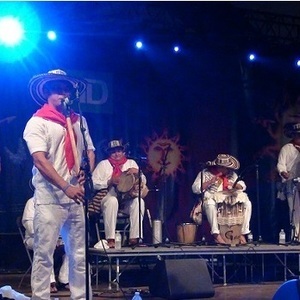 Los Gaiteros de San Jacitno has performed all over the world, in 2012 the band released their new musical production ASI TOCAN LOS INDIOS, and they toured Colombia, USA, Mexico and Canada. In 2015 Los Gaiteros de San Jacinto will be touring USA and for 2016 they are getting ready for Touring Asia, Europe, USA, Mexico, Canada among other countries. Los Gaiteros de San Jac..
La Cumbia de Arnulfa He..